Earlier this week, I was listening to Johnny Cash’s song, John Henry. Cash’s lyrics rang loud, “did the Lord say that machines oughtta take the place of livin’? …Do engines get rewarded for their steam?” Obviously, this is a major ethical debate in robotics, when machines replace the meager tasks of man. As Howard Schultz of Starbucks announced this week, free education provided by corporations could be the response in re-focusing hourly employees to more creative, human, endeavors. When gas pipelines breakdown the ripple effect can be seen downstream in a number of ways – elevated fuel, manufacturing and labor costs. For humans to survey millions of miles of pipelines is not realistic, nor practical. 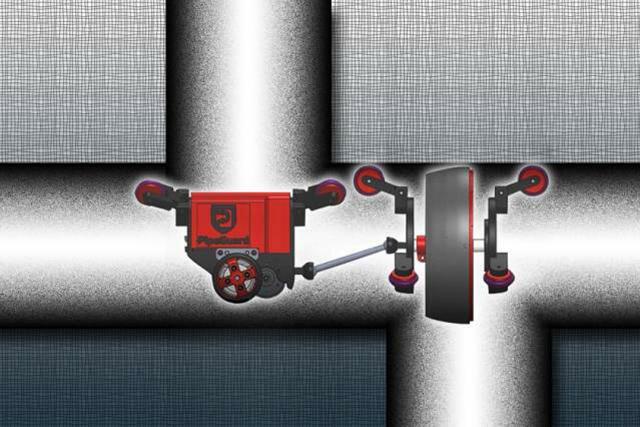 So a new robotic system capable of scanning gas pipes for leaks at rapid pace by sensing pressure changes developed has been applauded by the industry. This research effort was spearheaded by the joint teams of the Massachusetts Institute of Technology (MIT) and King Fahd University of Petroleum and Minerals (KFUPM) in Saudi Arabia. The result is a robot that offers better efficiency compared with existing leak detection methods, usually based on measuring sounds and vibrations caused by the leaks or using camera detectors inside the pipes manned by humans. The new device consists of a small wheeled robot capable of moving through the pipes, and a drum-like membrane that forms a seal across the width of the pipe. When a leak is encountered, liquid flowing toward it distorts the membrane, pulling it slightly toward the leak. That distortion can be detected by force-resistive sensors via a carefully designed mechanical system and the information sent back via wireless communications. “This technology allows for an unambiguous and reliable sensing of very small leaks that often go undetected for long periods of time,” said MIT mechanical engineering professor Kamal Youcef-Toumi, a co-author of the system. The researchers have begun discussions with gas companies and water companies — the system can also detect leaks in water pipes, or in petroleum pipelines — about setting up field tests in real-world conditions. The robots can move through the pipes at 3 mph, making the method much faster than conventional acoustic or visual surveying. The low cost and automated nature of the robots makes them suitable to be left inside the pipes indefinitely, providing continuous monitoring. According to Rached Ben-Mansour, a professor of mechanical engineering at KFUPM and co-author of the study, current leak-detection systems typically cost about $250,000 annually to monitor 100 kilometres of a pipe. “We’re hoping this system will be much more affordable, as well as faster and more sensitive,” he said. The robots could be manufactured in various sizes to fit virtually all types of pipes.